Steven (Chicagoland, United States) on 12 September 2012 in Landscape & Rural and Portfolio. San Diego marked the starting point for our drive along the Pacific Coast Highway heading north to San Francisco. Little did I know how many pictures I would take along this journey over the course of eight days. We drove to Point Loma and visited the Cabrillo Formation. 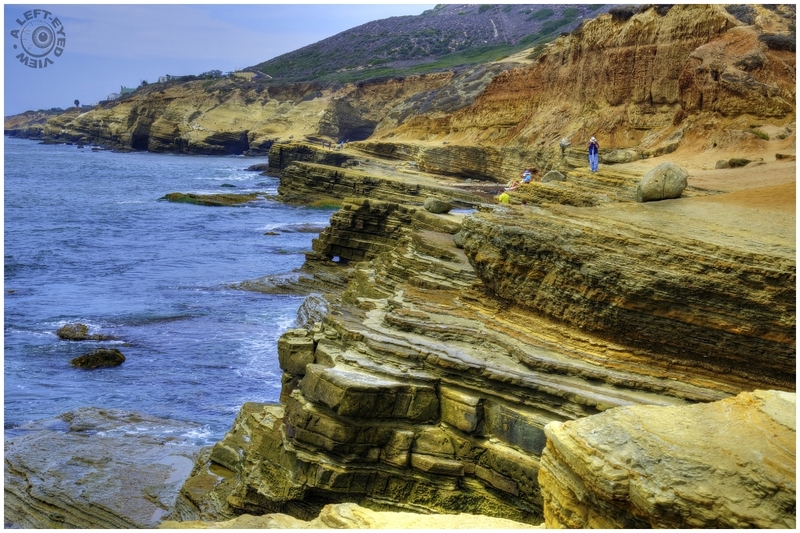 The Cabrillo Formation is composed mainly of sandstones and conglomerates, and is approximately 70 million years old. Fossils from this formation are not well known and consist of remains of marine invertebrates and vertebrates. The Cabrillo Formation crops out along the eastern and southwestern sides of the Point Loma peninsula in both sea cliff exposures and road cuts. It is also exposed on the western, northern, and eastern flanks of Mount Soledad. Photo captured August 15, 2012. Looks like a very dramatic coast line. A great view too with people giving scale!! Incredible view - all those layers of geological time. Very beautiful ! And impressiv !! wonderful frame and so specific processing that I would always recognize your photo . I just love that strata in the rock combined with the blues of the sky and water. Lovely, Steven! Spot - on framing and processing. Such an amazing landscape ! ANother lovely view of the layers. The massiveness is seen by the tiny people size. Beautiful frame including the water lapping on the rock formation ~ great scene! a wonderful picture at the geology of that place ... and most attractive, vivid colours ! Superb photo with an excellent framing and a very nice processing. Have a lovely afternoon. Amicably Antoine. Fascinating strata and formation. Superb picture too ! A nice angle on the formation. The people give us the scale. I like this one better. I like the longer view of the point at the left, as well as the palcement of the humans in the frame. What an amazing coastline! Beautiful! Exquisite, both coastline and photo.